Showing items in category Cayman Islands, sorted by newest listed first. CAYMAN ISLANDS - 1900 1/2d and 1d adhesives mint from PLATE 3. SG 1 and 2. 1900 1/2d green (small tone perf edge) and 1d carmine both fine mint and showing PLATE 3 in margins. SG 1+2. CAYMAN ISLANDS - 1913 4 1/2d rate registered cover to USA used at GEORGETOWN. 1913 (DE.11.) registered cover addressed to USA bearing 1/2d, 1d and 3d adhesives tied by GEORGETOWN/GRAND CAYMAN cds's. A fine 4 1/2d registered rate franking. 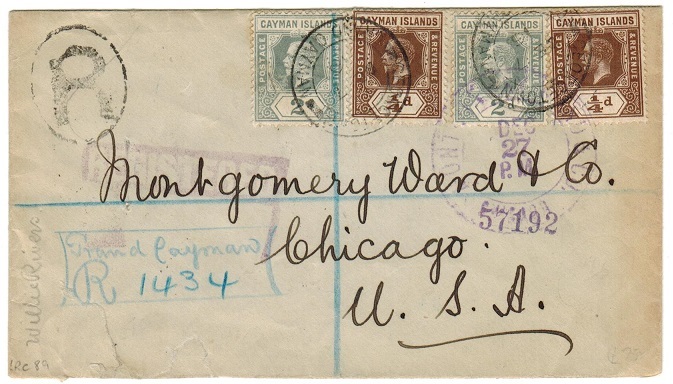 CAYMAN ISLANDS - 1921 3d rate registered cover to USA (crease) with 1 1/2d 'War Stamp' added. 1921 (SP.14.) registered cover to USA (vertical fold) bearing Edward VII 1d carmine (x3) tied in combination with the 1 1/2d on 2d grey 'War Stamp' (SG 58) tied by GEORGETOWN/ GRAND CAYMAN cds and with large violetR/GRAND CAYMAN/No. h/s on reverse. 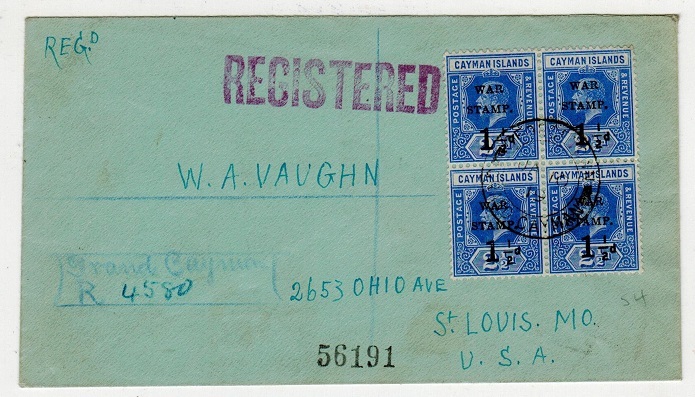 CAYMAN ISLANDS - 1921 4d rate registered cover to USA with 1/2d 'War Stamp' (x3) added. 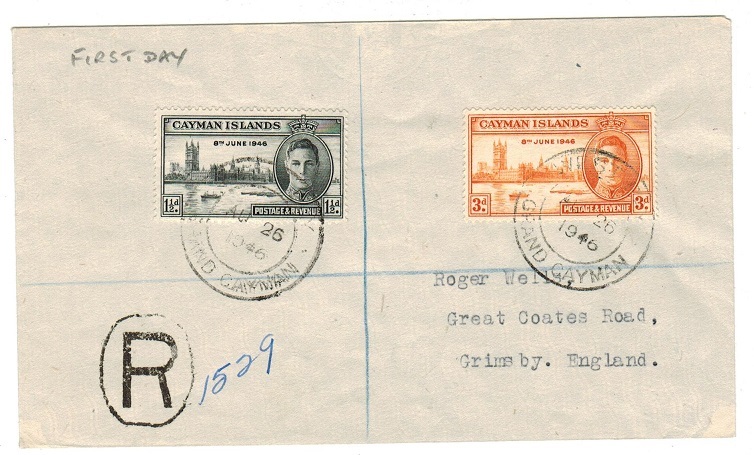 CAYMAN ISLANDS - 1936 2/- rate registered cover to UK used at GEORGETOWN. 1936 (MY.29.) registered cover to UK bearing the 2/- violet on blue adhesive (SG 80) tied by GEORGETOWN/CAYMAN ISLANDS cds. A scarce franking. CAYMAN ISLANDS - 1943 'OPENED BY CENSOR D/ (41)' censor cover to USA. 1943 (DE.9.) 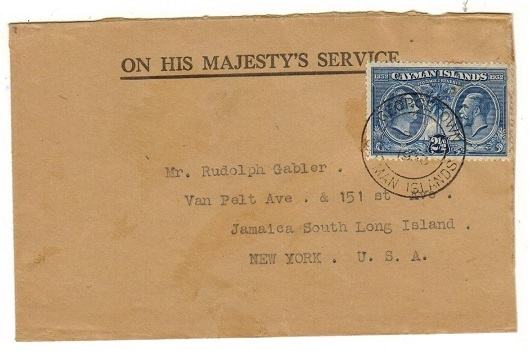 cover addressed to USA bearing 2d, 3d and 6d adhesives tied GEORGETOWN/ CAYMAN ISLANDS and with black on cream P.C.90/OPENED BY/EXAMINER D/ censor label at left struck by black boxed '41' handstamp. 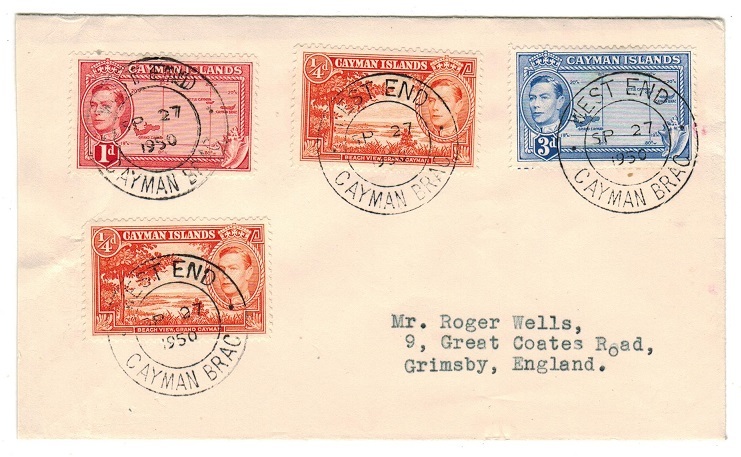 CAYMAN ISLANDS - 1933 2 1/2d 'Centenary' adhesive on OHMS cover to USA. 1933 (AP.12.) use of small O.H.M.S. envelope addressed to USA bearing the 2 1/2d blue 'Centenary' adhesive tied GEORGETOWN/CAYMAN ISLANDS. These Centenary issues are not easy to find on cover having a limited use. 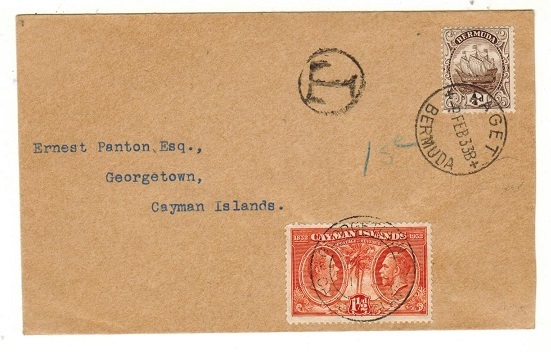 CAYMAN ISLANDS - 1924 4 1/2d rate registered cover to UK used at GEORGETOWN. 1924 (JU.23.) 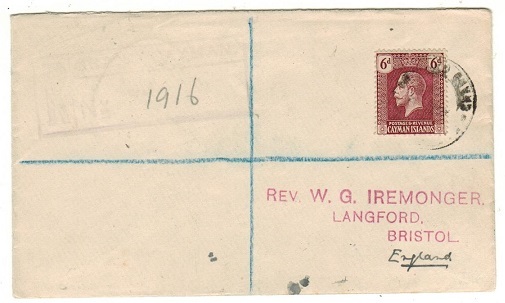 registered cover to UK bearing 1 1/2d strip of three tied by GEORGETOWN/ GRAND CAYMAN cds. CAYMAN ISLANDS - 1922 7d rate registered cover to UK used at GEORGETOWN. 1922 (NO.15.) 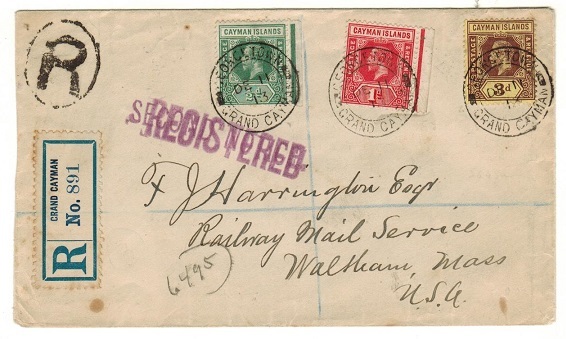 registered cover addressed to UK bearing 3d and 4d adhesives (SG 60+62) tied GEORGETOWN/GRAND CAYMAN. CAYMAN ISLANDS - 1927 4 1/2d rate registered cover to UK used at GEORGETOWN. 1927 (MY.30.) 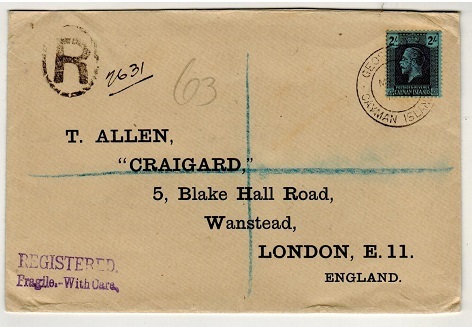 registered cover addressed to UK bearing 4 1/2d adhesive (SG 76) tied by GEORGETOWN/GRAND CAYMAN cds. 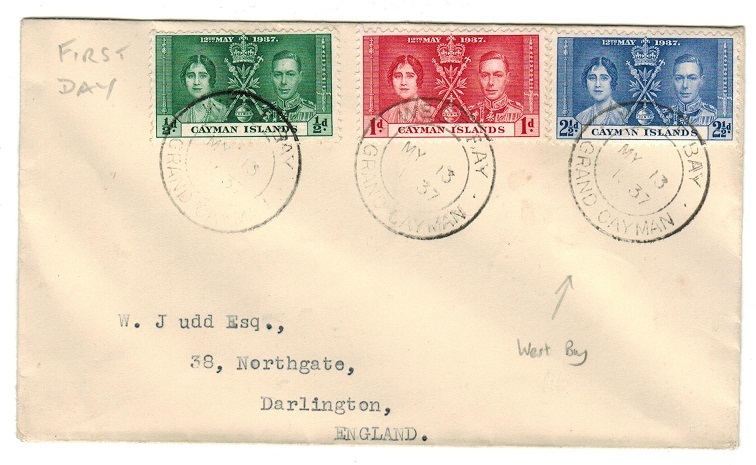 CAYMAN ISLANDS - 1925 6d rate registered cover to UK. 1925 registered cover addressed to UK bearing 6d claret adhesive (SG 77-scarce) but struck by somewhat smudged GEORGETOWN/GRAND CAYMAN. CAYMAN ISLANDS - 1917 2 1/2d rate cover to USA used at GEORGETOWN. 1917 (MY.5.) cover addressed to USA bearing 1/2d and 2d adhesives tied by GEORGETOWN/ GRAND CAYMAN cds. 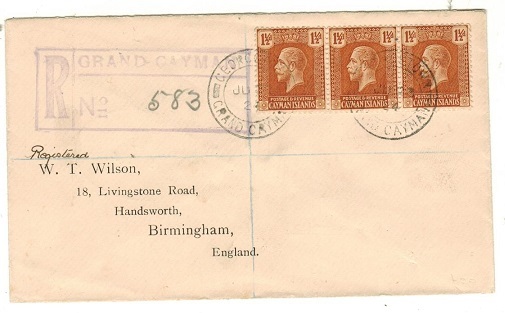 CAYMAN ISLANDS - 1933 inward underpaid cover from Bermuda with 1 1/2d adhesive added as postage due. 1933 (FE.9.) inward underpaid 'Panton' cover from Bermuda bearing 1/4d brown 'ship' adhesive tied PAGET/BERMUDA with circular 'T' tax mark and with Cayman Islands 1 1/2d orange 'Centenary' adhesive added in lieu of postage due and cancelled GEORGETOWN/CAYMAN ISLANDS. 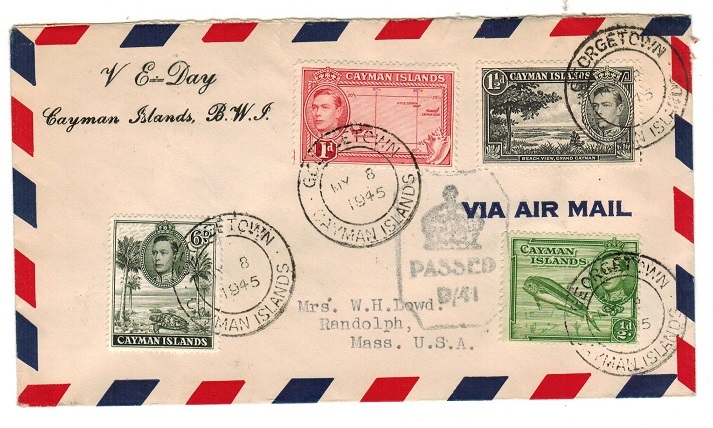 Caymans did not have any postage dues at this time. 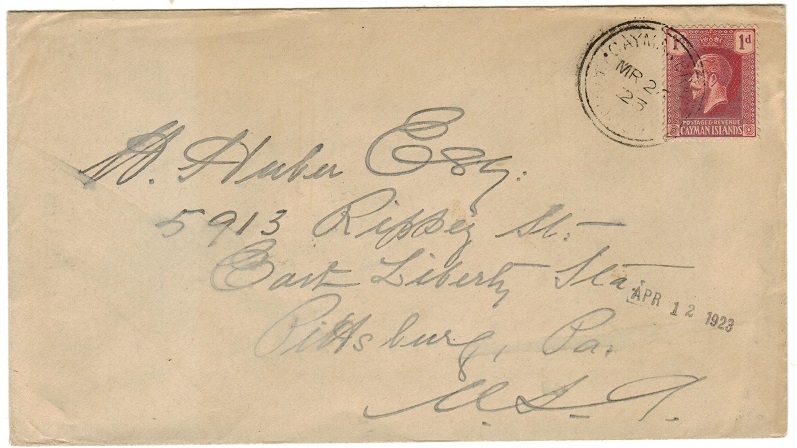 CAYMAN ISLANDS - 1916 4 1/2d rate registered cover to USA used at GEORGETOWN. 1916 (DE.7.) 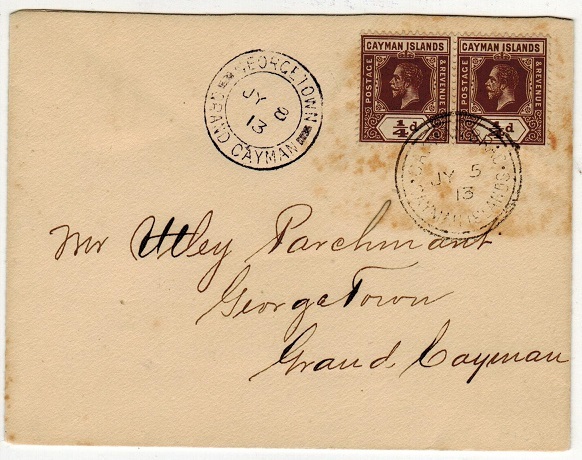 registered cover addressed to USA (small fault at bottom edge from opening) bearing 1/4d brown (x2) and 2d grey (x2) tied by GEORGETOWN/GRAND CAYMAN cds's with blue manuscript 'Grand Cayman/R 1434' annotation below. Some light shadow markings on reverse side. 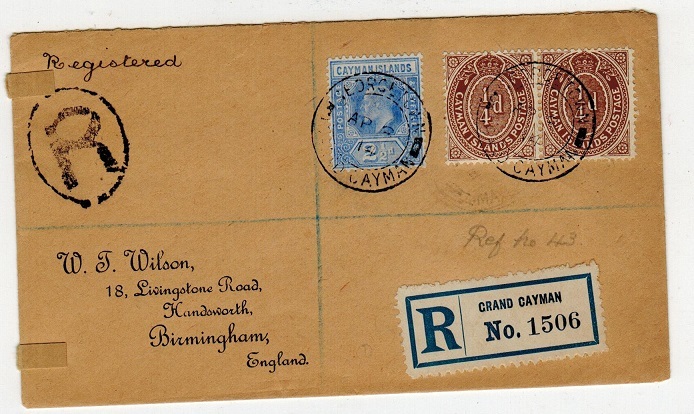 CAYMAN ISLANDS - 1914 3d rate registered cover to UK used at GRAND CAYMAN. 1914 (AP.8.) 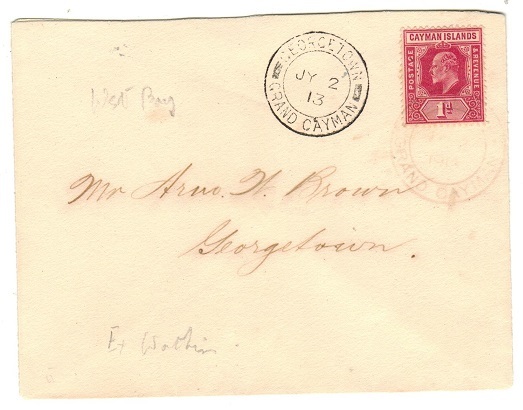 registered (Wilson) cover addressed to UK bearing a fine pair of the 1/4d brown adhesive tied in combination with the Edward VII 2 1/2d (SG 27+38) by GEORGETOWN/ GRAND CAYMAN cds. REGISTERED/JAMAICA transit b/s. CAYMAN ISLANDS - 1912 1d rate local cover used at GEORGETOWN. 1912 (OC.25.) 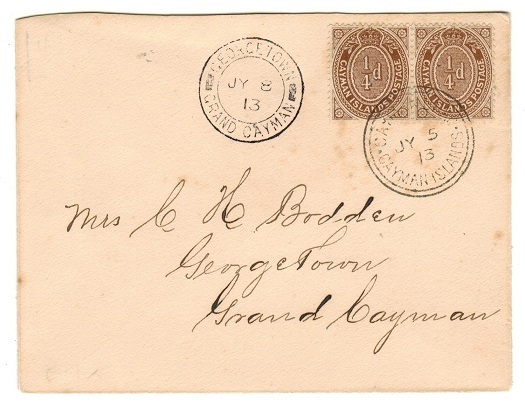 cover addressed locally bearing 1d (SG 26) tied by GEORGETOWN/GRAND CAYMAN cds. A nice internal 1d rate cover. 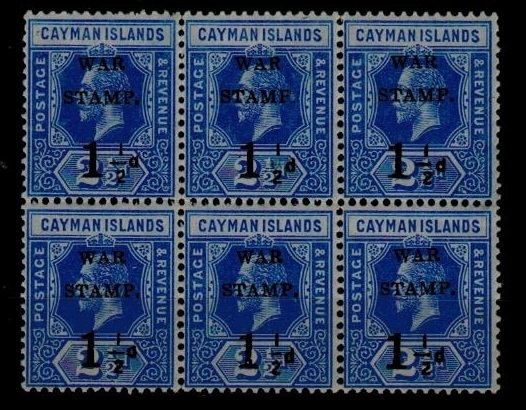 CAYMAN ISLANDS - 1920 1 1/2d 'War Stamp' pair on 'FORMULA' RPSE to Jamaica. 1920 (AU.4.) 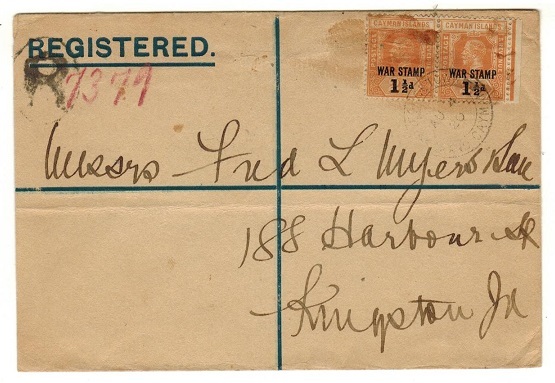 use of blue on buff FORMULA registered postal stationery envelope addressed to Jamaica bearing a pair of the 1 1/2d orange 'War Stamp' issue (SG 59) tied GEORGETOWN/ GRAND CAYMAN. Horizontal fold ironed out and with some messy glue marks around the stamps. An unusual singular use however of these war stamp overprints and with JAMAICA arrival b/s. 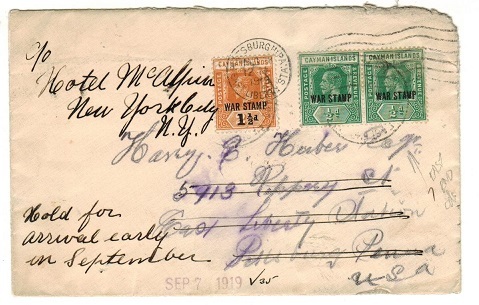 CAYMAN ISLANDS - 1919 'War Stamp' only cover to USA used at EAST END. 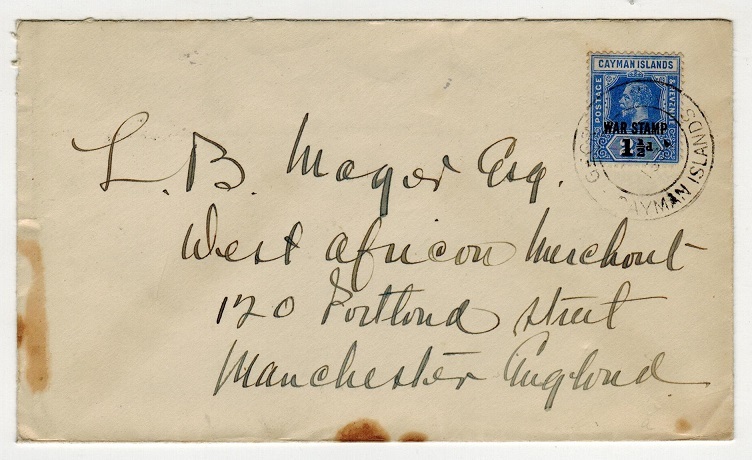 1919 cover addressed to USA and then re-directed bearing 1/2d green 'War Stamp' pair together with 1 1/2d 'War Stamp' (SG 57+59) tied by light (partly readable) EAST END cds with JAMAICA transit b/s. A scarce use of only 'war stamp' stamps at East End. 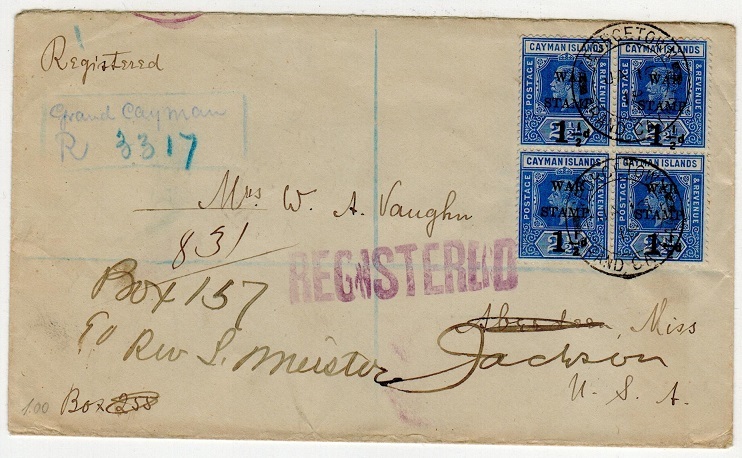 CAYMAN ISLANDS - 1913 scarce 1/4d (x2) local franking cover used at CAYMAN BRAC. 1913 (JY.5.) 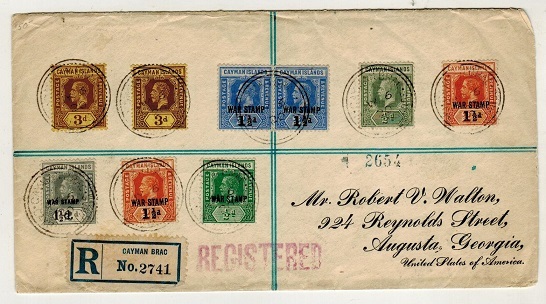 locally addressed cover bearing a pair of the 1/4d brown adhesive (SG38) tied by d/r CAYMAN BRAC cds with GEORGETOWN arrival cds at left 3 days later. A rare franking using these 1/4d adhesives. CAYMAN ISLANDS - 1909 2 1/2d rate cover to USA used at BODDENTOWN. 1909 (DE.31.) 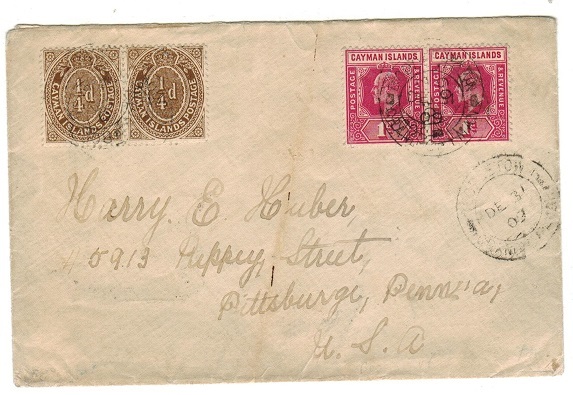 cover addressed to USA bearing 1d (SG 26) pair together with 1/4d (SG 38) pair tied by BODDENTOWN/GRAND CAYMAN cds with GEORGETOWN transit strike below and KINGSTON/JAMAICA cds on reverse with PITTSBURG arrival. Ascarce combination used at BODDENTOWN. 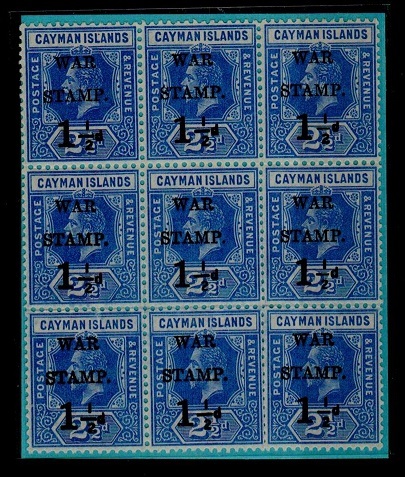 CAYMAN ISLANDS - 1909 2 1/2d blue PSE unused. H&G 2a. 1909 2 1/2d ultramarine on light greyish blue postal stationery envelope (type b) in fine unused condition. H&G 2a. 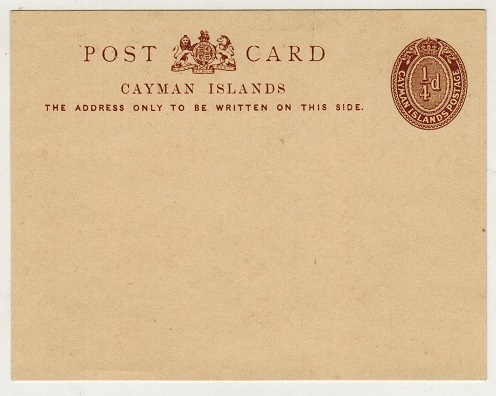 CAYMAN ISLANDS - 1909 1d red PSE unused. H&G 1. 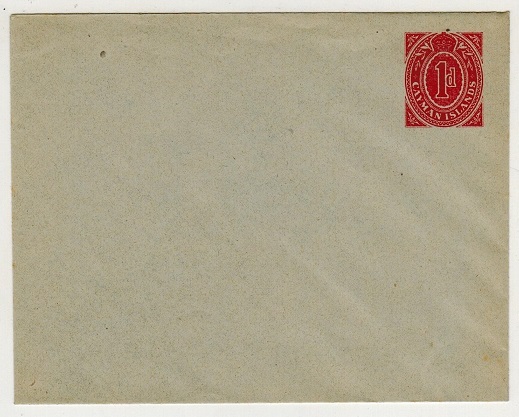 1909 1d red on greyish paper with blue overlay inside postal stationery envelope in fine unused condition. H&G 1. CAYMAN ISLANDS - 1909 1/2d green postal stationery wrapper unused. H&G 1. 1909 1/2d green on buff postal stationery wrapper in fine unused condition. H&G 1. 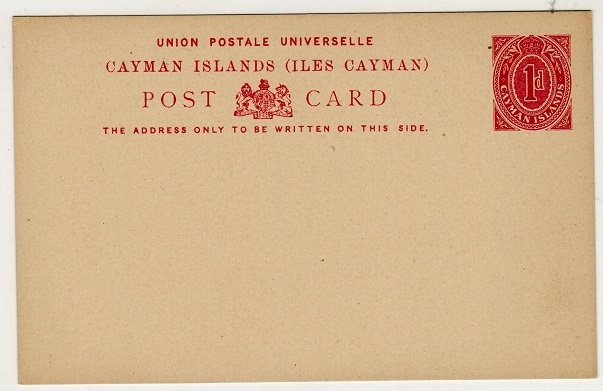 CAYMAN ISLANDS - 1909 1d red PSC unused. H&G 3. 1909 1d red on buff postal stationery postcard in fine unused condition. H&G 3. CAYMAN ISLANDS - 1909 1/4d brown PSC unused. H&G 1. 1909 1/4d brown on cream postal stationery postcard in fine unused condition. H&G 1. 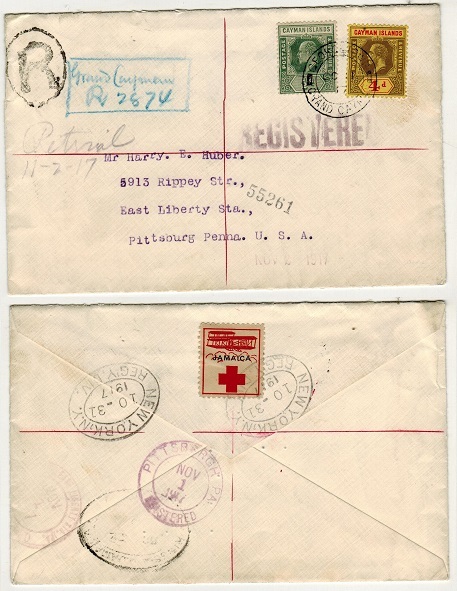 CAYMAN ISLANDS - 1917 mixed franking registered cover to USA with JAMAICA/RED CROSS label. 1917 (OC.11.) registered cover to USA bearing 1/2d and 4d adhesives tied GEORGETOWN/GRAND CAYMAN with blue manuscript 'GRAND CAYMAN/R 2874' registered etiquette at left. The reverse side bears a copy of the JAMAICA/RED CROSS perforated label tied by NEW YORK arrival cancel. CAYMAN ISLANDS - 1918 'War Stamp' registered cover to Canada used at GEORGETOWN. 1918 (NO.9.) 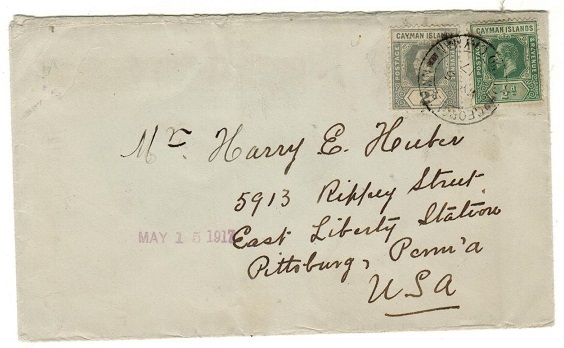 registered cover addressed to Canada bearing a block of four, a pair and a single of the 1 1/2d on 2 1/2d (SG 56) 'War Stamp' adhesive tied by GEORGETOWN/GRAND CAYMAN cds's and with scarce violet boxed GRAND CAYMAN/R registered h/s at left. (Giraldi type R7). CAYMAN ISLANDS - 1919 mixed 'War Stamp' registered cover to France (unusual) used at GEORGETOWN. 1919 (AP.17.) 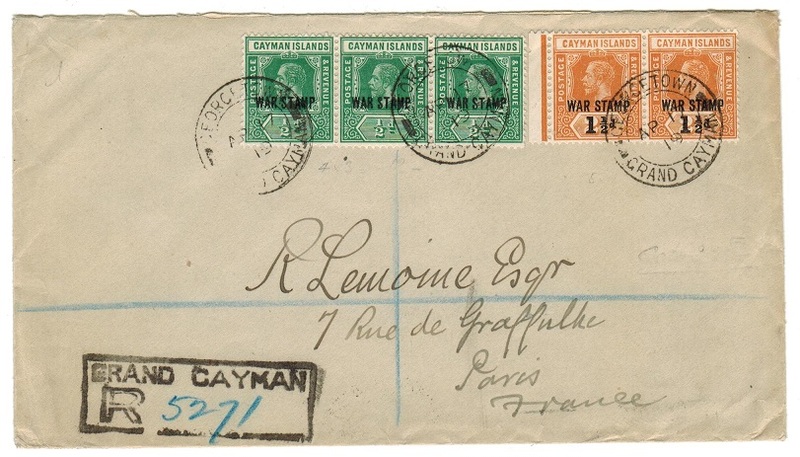 registered cover addressed to France (unusual destination) bearing 1/2d green (x3) 'War Stamp' (SG 57) and 1 1/2d on 2 1/2d orange (x2) 'War Stamp' (SG 59) tied by GEORGETOWN/CAYMAN ISLANDS cds with black boxed GRAND CAYMAN/R h/s at lower left. (Giraldi type R7). This is scarce in black. 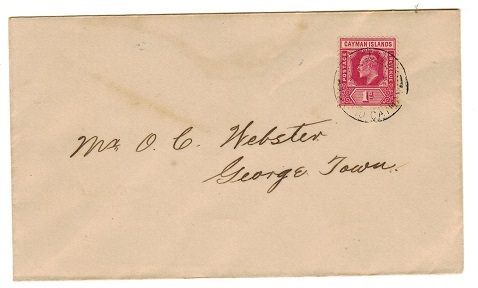 CAYMAN ISLANDS - 1919 registered 'War Stamp' cover to USA used at GEORGETOWN. 1919 (JA.10.) 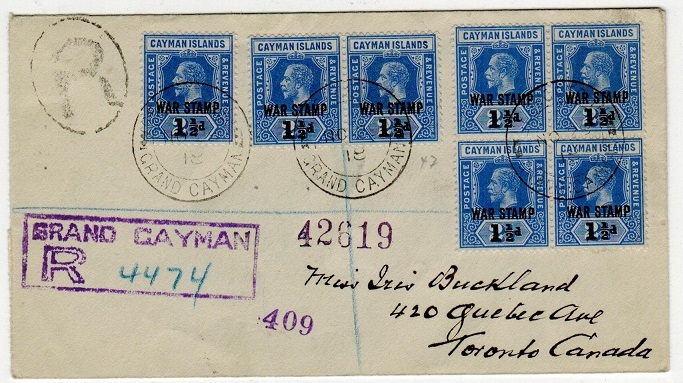 registered cover addressed to USA bearing 1 1/2d on 2 1/2d 'War Stamp' adhesive (SG 54) in a fine block of four cancelled by central GEORGETOWN/GRAND CAYMAN cds with blue crayon R/GRAND CAYMAN/R registered marking at left. KINGSTON transit b/s. 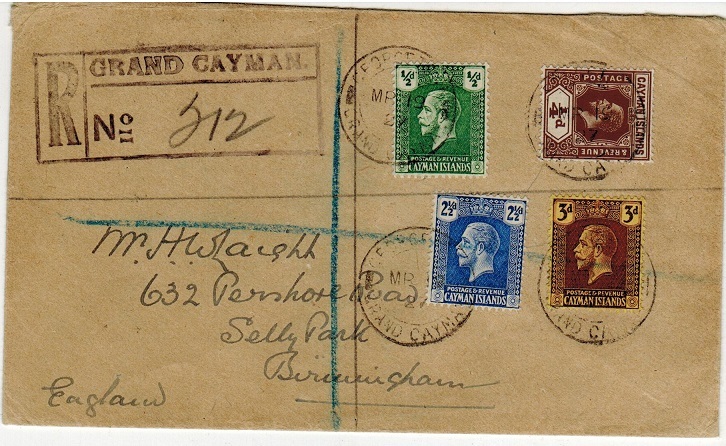 CAYMAN ISLANDS - 1927 registered cover to UK used at GEORGETOWN. 1927 (MR.19.) registered cover addressed to Birmingham bearing 1/4d 'key plate' together with 1/2d, 2 1/2d and 3d adhesives tied by GEORGETOWN/GRAND CAYMAN cds with black rubber boxed R/GRAND CAYMAN/No. registered h/s at left. CAYMAN ISLANDS - 1966 1/- 'Churchill' adhesive in a U/M blk of 4 with INVERTED WATERMARK. SG 190w. 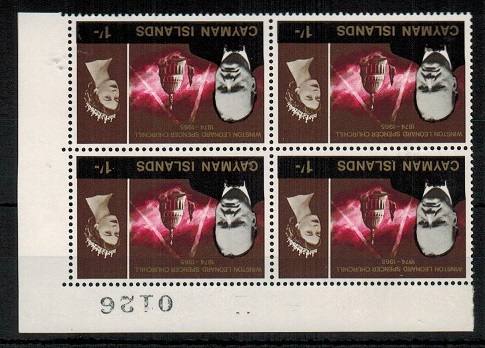 1966 1/- 'Winston Churchill' adhesive in a fine unmounted mint corner sheet numbered block of four with variety WATERMARK INVERTED. SG 190w. 1950 definitive pictorial series of 13 in fine unmounted mint marginal examples. SG 135-37. CAYMAN ISLANDS - 1953 definitive short set to 10/- U/M. SG 148-161. 1953 'QEII' definitive pictorial short set to 10/- all fine unmounted mint. SG 148-161. 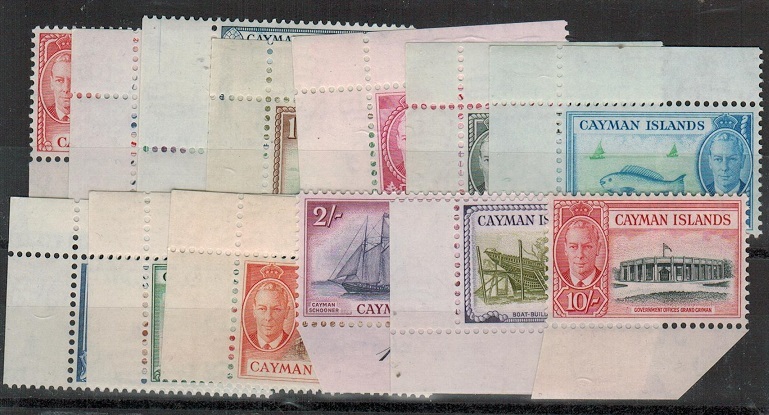 CAYMAN ISLANDS - 1962 definitive set of 15 U/M. SG 165-79. 1962 'QE II' definitive pictorial series of 15 in unmounted mint condition. SG 165-79. CAYMAN ISLANDS - 1945 'V-Day' censored cover to USA used from GEORGETOWN. 1945 (MY.8.) 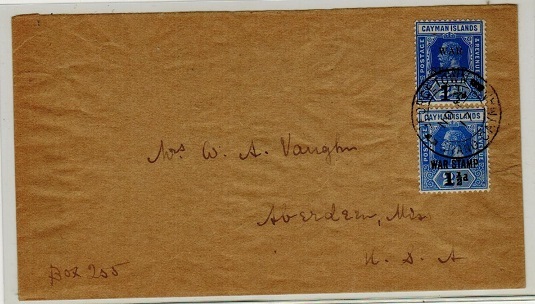 pre-printed 'V.E.Day' envelope addressed to USA bearing 1/2d, 1d, 1 1/2d and 6d adhesives tied by GEORGETOWN/CAYMAN ISLANDS cds and struck by scarce black crown octagonal PASSED/ D/41 censor h/s. CAYMAN ISLANDS - 1946 3d 'Victory' fine mint with STOP AFTER 1946 variety. SG 128a. 1946 3d orange-yellow 'Victory' adhesive in fine mint condition showing the variety STOP AFTER 1946 from Row 2/1 of plate B1. SG 128a. CAYMAN ISLANDS - 1913 1d rate local cover used at WEST BAY. 1913 (JY.2.) cover addressed locally bearing 1d (SG 26) tied by light WEST BAY/GRAND CAYMAN d/r cds with GEORGETOWN arrival cds alongside. Ex Watkins collection. 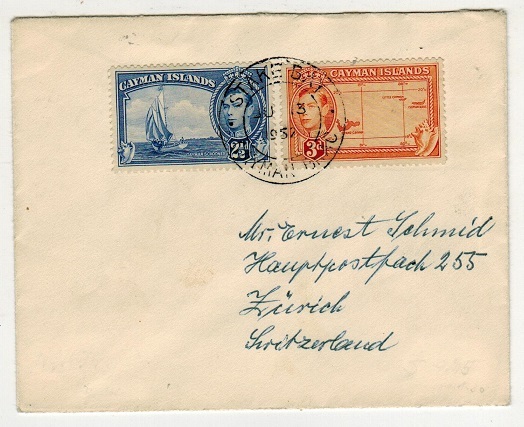 CAYMAN ISLANDS - 1952 cover to Switzerland used at STAKE BAY. 1952 (JU.13.) cover addressed to Switzerland bearing KGVI 2 1/2d and 3d adhesives tied by STAKE BAY/CAYMAN BRAC cds. 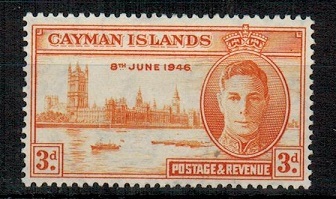 CAYMAN ISLANDS - 1934 late use of 1 1/2d 'War Stamp' to UK. 1934 (FE.2.) cover addressed to UK bearing the 1 1/d on 2 1/2d 'War Stamp' adhesive tied by GEORETOWN/CAYMAN ISLANDS cds. A rare genuine (non philatelic) late use of this War Tax stamp. CAYMAN ISLANDS - 1916 4 1/2d rate registered cover to USA used at GEORGETOWN/GRAND CAYMAN. 1916 (MY.25.) 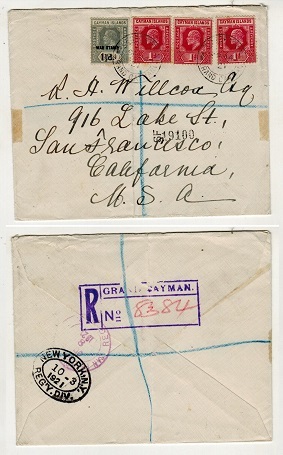 registered cover to USA beaing 1/2d and 2d pair (one with corner fault) tied by GEORGETOWN/GRAND CAYMAN cds and with blue 'Grand Cayman/R' registered h/s applied at left in manuscript. 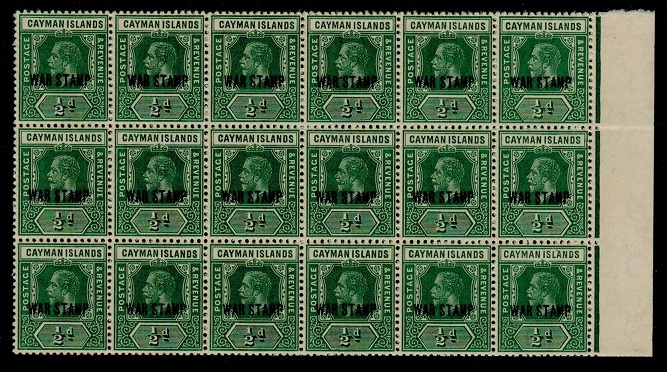 CAYMAN ISLANDS - 1917 1 1/2d on 2 1/2d 'WAR STAMP' issues used and mint pair with LARGE STOP. SG 54. 1917 1 1/2d on 2 1/2d 'War Stamp' adhesive fine used (SG 53) together with a mint horizontal pair (SG 54) with one stamp showing the LARGE STOP variety. 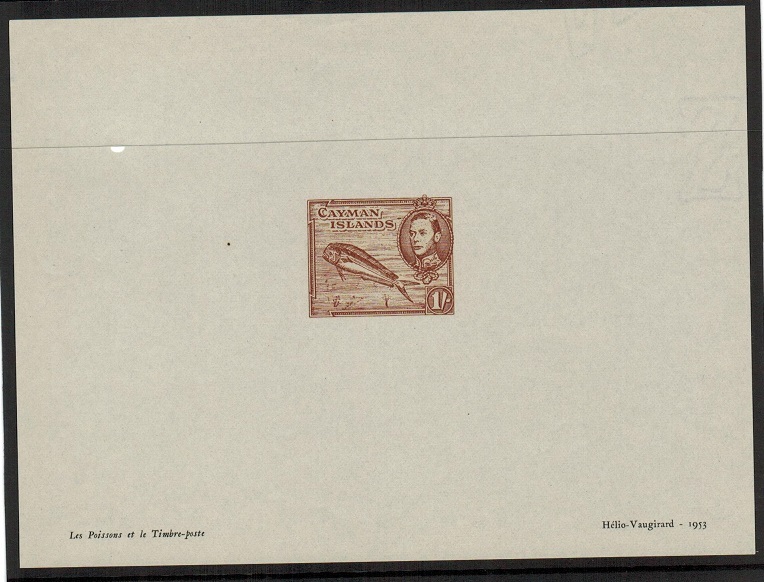 CAYMAN ISLANDS - 1938 1/- (SG type 27) 'Vaugirard' IMPERFORATE PLATE PROOF. 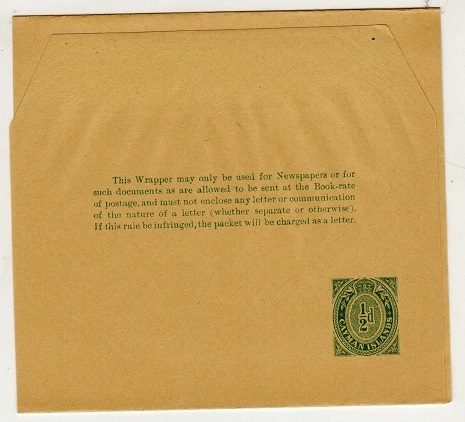 1938 1/- (SG type 27) IMPERFORATE PLATE PROOF printed in the issued colour of red-brown on a cut down cream paper printed by Vaugirard and produced as a sample of the companies work. 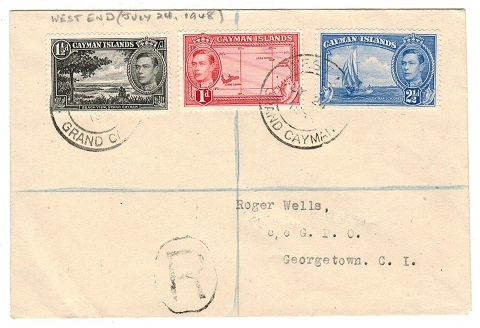 CAYMAN ISLANDS - 1932 OHMS cover to USA with 2 1/2d tied GEORGETOWN. 1932 (OC.11.) use of long OHMS cover addressed to USA (slightly reduced at left edge from opening) and bearing 2 1/2d adhesive tied GEORGETOWN/CAYMAN ISLANDS. 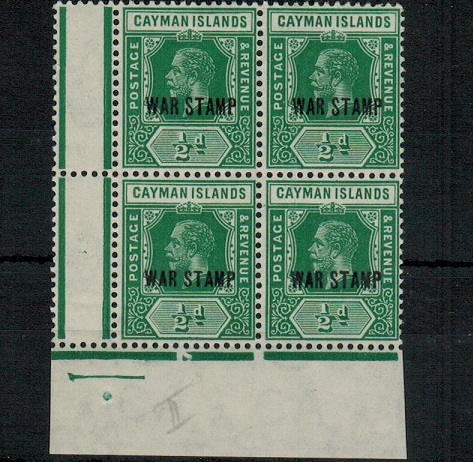 CAYMAN ISLANDS - 1919 1/2d 'War Stamp' mint block of four with SMALL OVERPRINT variety. SG 57. 1919 1/2d green in a fine mint corner gutter marginal block of four showing the SMALL OVERPRINT variation on Row 10/1 right pane. SG 57. 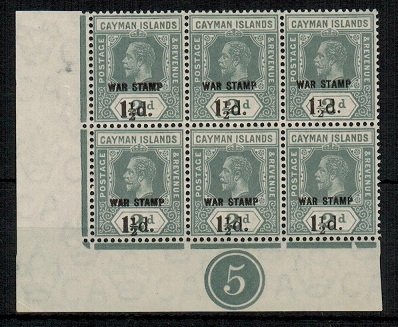 CAYMAN ISLANDS - 1917 1 1/2d surcharged 'War Stamp' with SHORT FRACTION in mint block of nine. 1917 1 1/2d on 2 1 1/2d deep blue fine mint block of nine (3x3 - last row with light vertical fold) showing the SHORT FRACTION BAR variety. SG 54. CAYMAN ISLANDS - 1953 'Helio Vaugirard' sample PROOF of the KGVI 1/- brown (SG type 27). 1953 'Helio Vaugirard' IMPERFORATE PROOF of the 1/- brown 'dolphin fish' adhesive of KGVI (SG type 27) printed in the issued colour of red brown on cream ungummed paper (156x116mm) and marked 'Les Poissons et le Timbre poste' at bottom left corner. Fine and scarce. Used as a sample by this printing company to show there work. CAYMAN ISLANDS - 1920 1 1/2d on 2d grey 'War Stamp' PLATE 5 mint block of four. SG 58. 1920 1 1/2d on 2d grey 'War Stamp' in a fine mint PLATE 5 corner marginal block of six. SG 58. 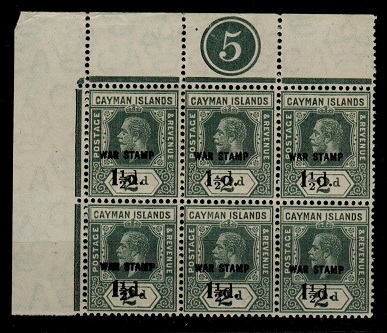 CAYMAN ISLANDS - 1917 1 1/2d on 2 1/2d 'War Stamp' strip of 4 with variety. SG 54. 1917 1 1/2d on 2 1/2d deep blue 'War Stamp' overprinted adhesive in a fine mint left marginal strip of four with the 4th stamp showing the SHORT FRACTION BAR and SPUR TO M IN STAMP. SG 54. CAYMAN ISLANDS - 1945 'VE DAY' censor cover to USA. 1945 (MY.8.) use of pre-printed 'V E Day' airmail envelope addressed to USA bearing 1/2d, 1 1/2d, 2d and 6d adhesives tied GEORGETOWN/CAYMAN ISLANDS and struck on the front by octagonal crowned PASSED/ D/41 censor handstamp in black ink. CAYMAN ISLANDS - 1913 1/4d brown (x2) use on local cover. 1913 (JY.5.) 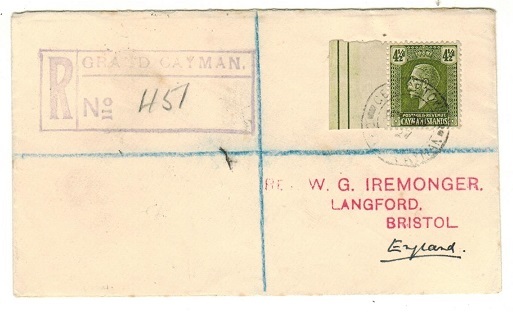 cover addressed locally bearing 1/4d brown (SG 40) pair tied by CAYMAN BRAC cds with GEORGETOWN arrival cds at left dated 3 days later. Some light staining below stamps but a nice internal cover with farthing stamp usage. 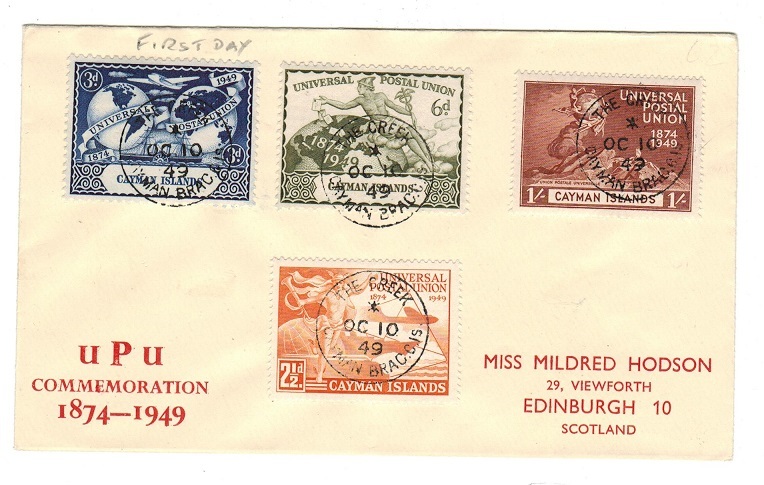 CAYMAN ISLANDS - 1949 UPU first day cover to UK used at THE CREEK. 1949 (OC.10.) illustrated first day cover bearing the 'UPU' series (SG 131-34) tied by s/r THE CREEK/CAYMAN BRAC cds. 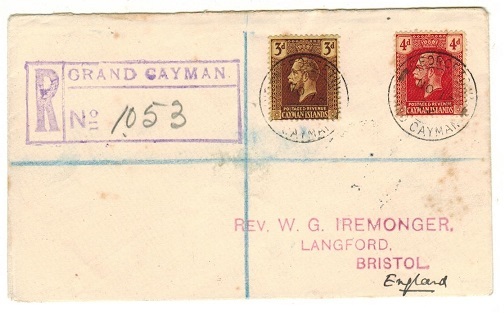 CAYMAN ISLANDS - 1950 cover to UK used at WEST END. 1950 (SP.27.) cover addressed to UK bearing 1/4d (x2), 1d and 3d adhesives tied by WEST END/ CAYMAN BRAC cds. CAYMAN ISLANDS - 1948 local registered cover used at WEST END. 1948 (JY.24.) registered cover to UK bearing 1d, 1 1/2d and 2 1/2d adhesives tied WEST END/ GRAND CAYMAN cds. 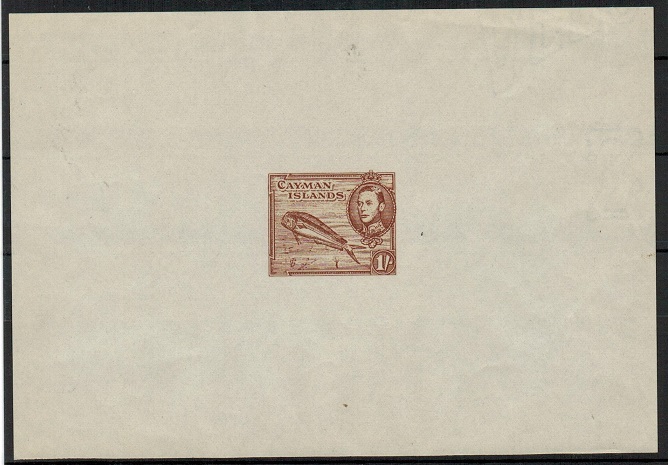 CAYMAN ISLANDS - 1946 'Victory' FDC to UK used at LITTLE CAYMAN. 1946 (AU.26.) first day cover to UK bearing the 'Victory' pair (SG 127-28) tied by LITTLE CAYMAN cds. CAYMAN ISLANDS - 1937 'Coronation' FDC to UK used at WEST BAY. 1937 (MY.13.) 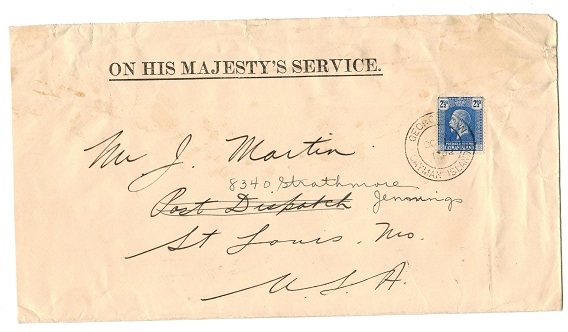 first day cover addressed to UK bearing the 'Coronation' trio (SG 112-14) tied by WEST BAY/GRAND CAYMAN cds. CAYMAN ISLANDS - 1946 registered 'Victory' FDC to UK used at WEST BAY. 1946 (AU.26.) registered first day cover to UK bearing the 'Victory' pair (SG 127-28) tied by WEST BAY cds. CAYMAN ISLANDS - 1953 illustrated 'Coronation' FDC used at STAKE BAY. 1953 (JU.2.) 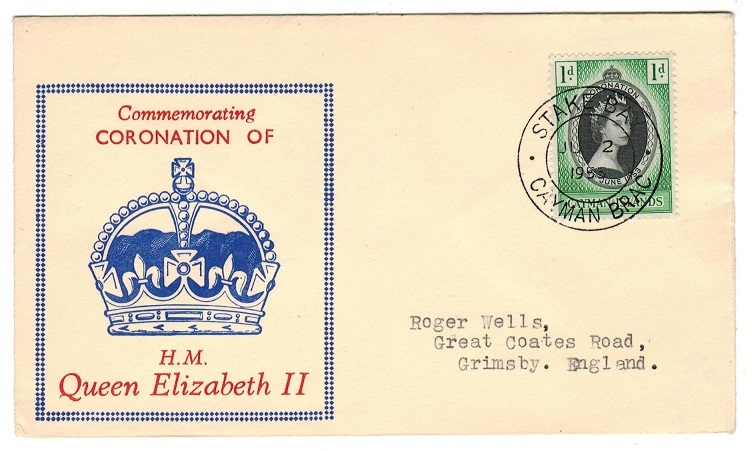 illustrated first day cover addressed to UK bearing 1c 'Coronation' issue tied by d/r STAKE BAY/CAYMAN BRAC cds. 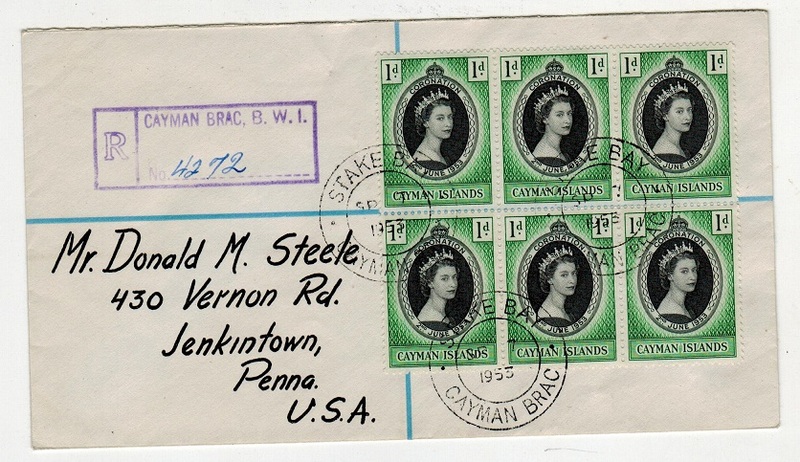 CAYMAN ISLANDS - 1953 registered cover to USA with 'Coronation' 1d blkx6 used at STAKE BAY. 1953 (SP.7.) registered cover to USA bearing a block of six of the 'Coronation' 1d adhesive tied by STAKE BAY/CAYMAN BRAC cds. CAYMAN ISLANDS - 1953 illustrated 'Coronation' FDC used at WEST BAY. 1953 (JU.2.) 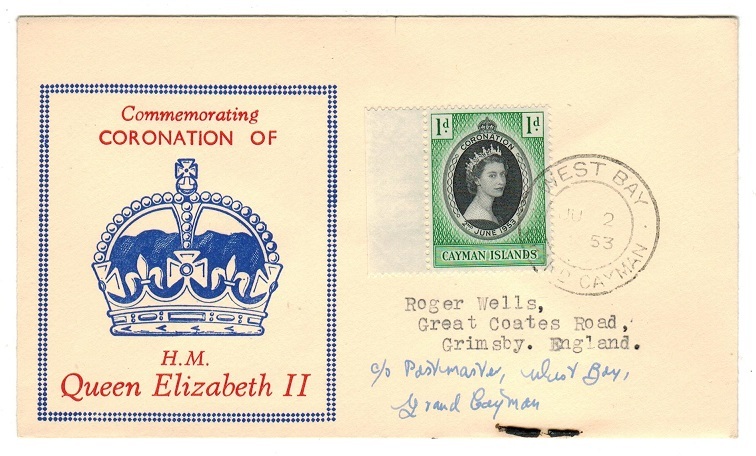 illustrated first day cover addressed to UK bearing 1c 'Coronation' issue tied by d/r WEST BAY/GRAND CAYMAN cds. 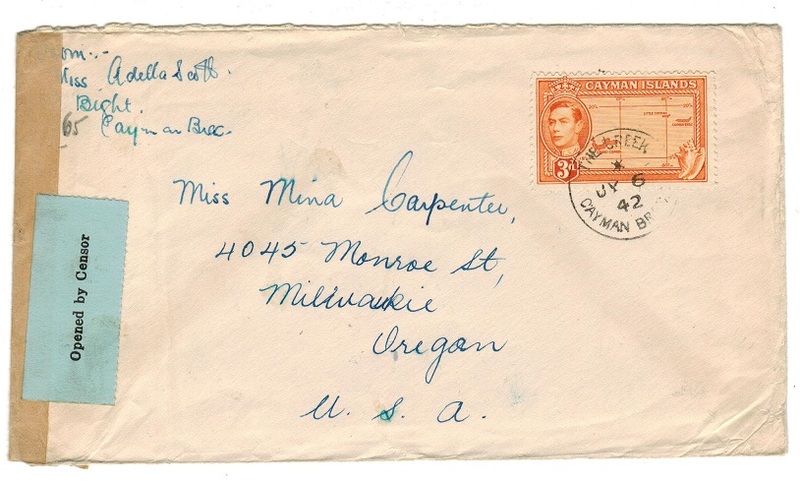 CAYMAN ISLANDS - 1942 censored cover to USA used at THE CREEK. 1942 (JY.6.) 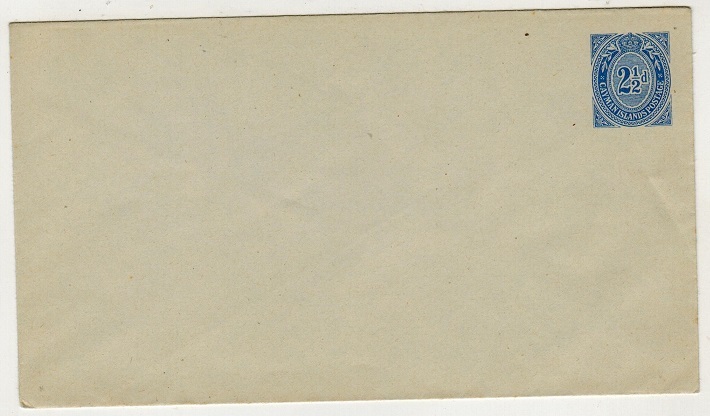 cover addressed to USA bearing 3d adhesive tied by THE CREEK/CAYMAN BRAC cds with (unlisted) manilla censor strip at left edge tied with black on pale blue OPENED BY CENSOR label on front. 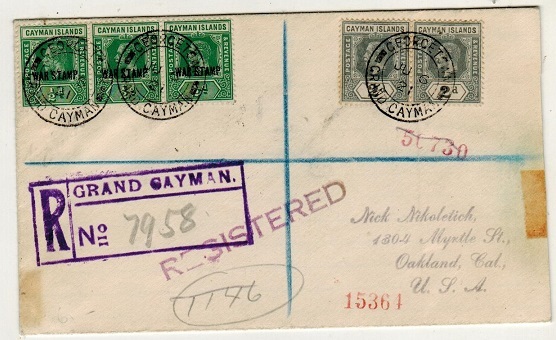 CAYMAN ISLANDS - 1923 1d rate cover to USA used at CAYMAN BRAC. 1923 (MR.26.) 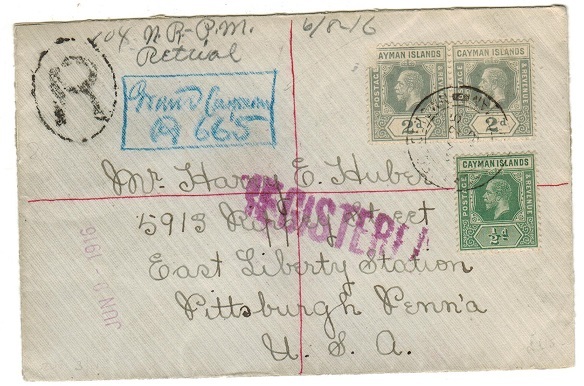 cover addressed to USA (Huber) bearing 1d (SG 71-slight oxidation) tied by CAYMAN BRAC/CAYMAN ISLANDS cds. CAYMAN ISLANDS - 1922 1 1/2d rate cover to Jamaica used at CAYMAN BRAC. 1922 (AU.30.) 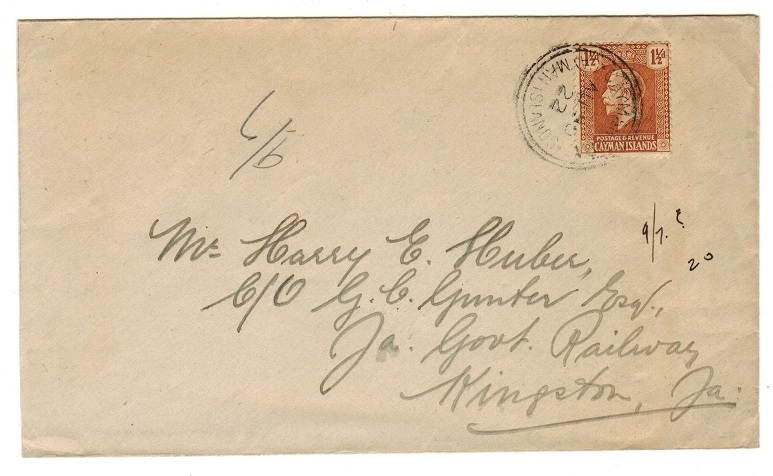 cover addressed to Jamaica (Huber) bearing 1 1/2d (SG 72) tied by CAYMAN BRAC/ CAYMAN ISLANDS cds. 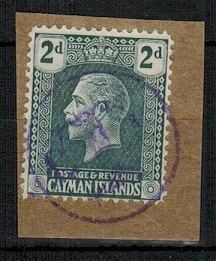 CAYMAN ISLANDS - 1921 1/2d green pair (SG 70) with 'T' POSTAGE DUE strike in violet. 1921-26 1/2d pale grey green adhesive pair tied to piece by two strikes of the circular 'T' violet strike used for postage dues. SG 70. CAYMAN ISLANDS - 1921 2d grey (SG 73) with 'T' POSTAGE DUE strike in violet. 1921-26 2d slate grey adhesive tied to piece by two strikes of the circular 'T' violet strike used for postage dues. SG 73. CAYMAN ISLANDS - 1908 1d black surcharge on 4d mint REVENUE adhesive. 1908 1d black surcharge on 4d black and red on yellow adhesive in fine mint condition. This adhesive was issued for revenue purposes and not intended for postal use although some examples are known cancelled by favour. A scarce stamp to find. (See SG footnote). CAYMAN ISLANDS - 1935 1/4d black and brown 'pictorial' complete sheet. SG 96. 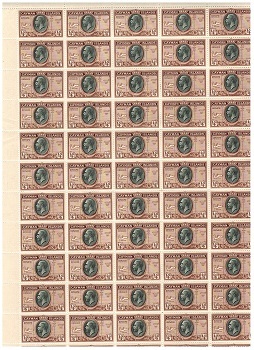 1935 1/4d black and brown in a complete 'Waterlow & Sons Ltd' imprint sheet of 60. SG 96. 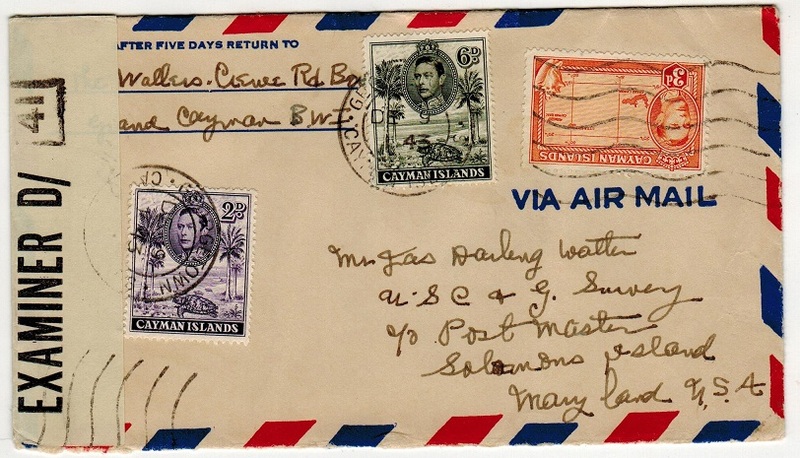 CAYMAN ISLANDS - 1953 special FORMULA 'Coronation' air letter from GEORGETOWN. 1953 (JU.2.) 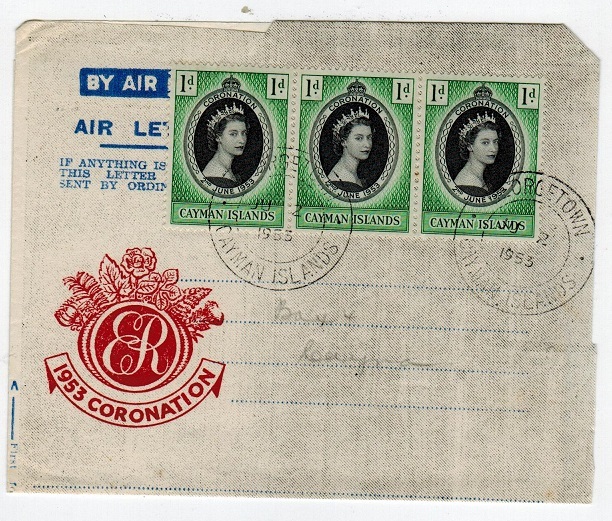 use of blue on cream (black dotted screen) FORMULA air letter addressed locally in pencil (no message) bearing 1d 'Coronation' adhesive trio tied by GEORGETOWN/CAYMAN ISLANDS cds with the airletter having been handstamped with large red ER/1953 CORONATION emblem at bottom left. Unusual item. 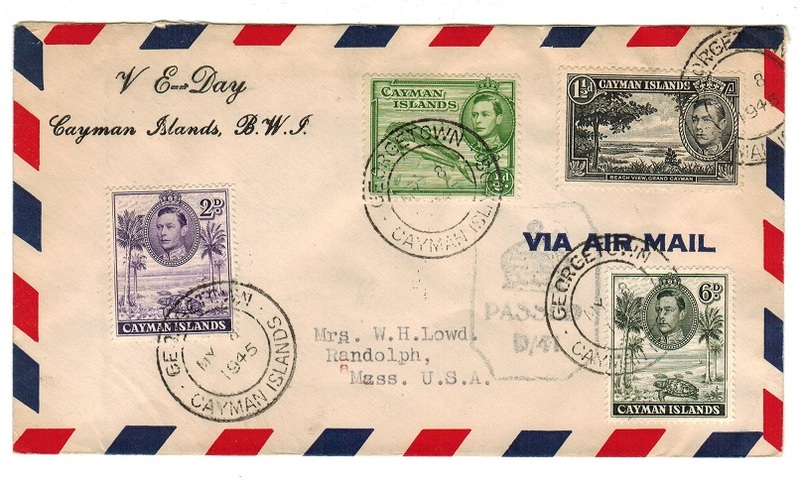 CAYMAN ISLANDS - 1947 first flight cover to Jamaica. 1947 (NO.3.) 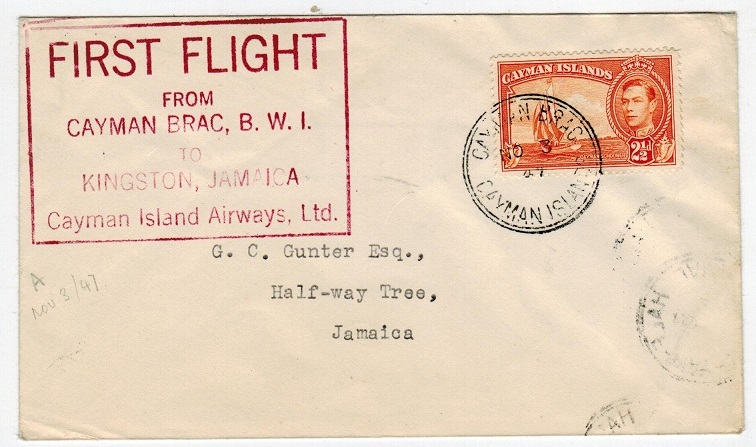 cover addressed to Jamaica bearing 2 1/2d orange adhesive tied CAYMAN BRAC with red boxed FIRST FLIGHT/FROM/CAYMAN BRAC BWI/TO/KINGSTON JAMAICA h/s at left. . HALF WAY TREE/JAMAICA b/s. These covers were prepared but the service did not take place by the Cayman Island Airways. 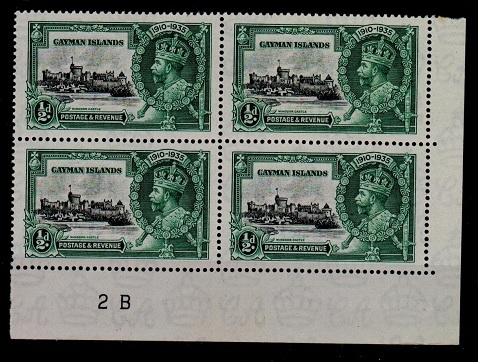 CAYMAN ISLANDS - 1900 1/2d pale green (SG 1a) fine used block of four. 1900 1/2d pale green in a fine used block of four cancelled by d/r GRAND CAYMAN/CAYMAN ISLANDS cds dated FE.7.06. Used blocks are not easy to find. SG 1a. 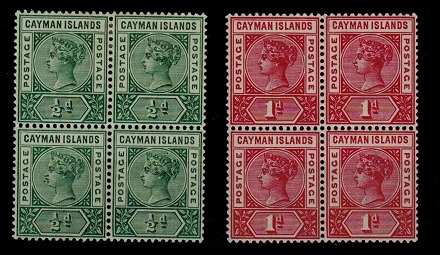 CAYMAN ISLANDS - 1900 1/2d green and 1d carmine in mint blocks of four. SG 1a+2. 1900 1/2d and 1d adhesives in fine fresh mint blocks of four. SG 1a+2. 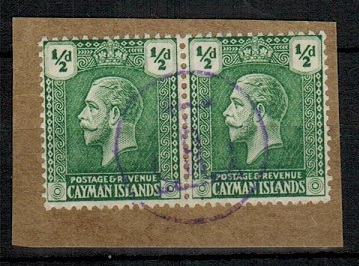 CAYMAN ISLANDS - 1908 1/4d brown pair used at EAST END/RURAL/POST COLLECTION. SG 38. 1908-09 1/4d brown (SG 38) horizontal pair cancelled by fine central EAST END/GRAND CAYMAN/RURAL/POST COLLECTION violet boxed h/s. Scarce strike. CAYMAN ISLANDS - 1920 1 1/2d on 2d grey mint with MISPLACED SURCHARGE. SG 58. 1920 1 1/2d on 2d grey 'War Stamp' in fine mint condition showing a the variety GROSS MISPLACEMENT OF OVERPRINT. The '1 1/2d' being at the very bottom of the stamp and partly at the top from the above stamp. Unusual item. SG 58. CAYMAN ISLANDS - 1920 1 1/2d on 2d grey mint pair with MISSING SERIF variety. SG 58. 1920 1 1/2d on 2d grey WAR STAMP overprint adhesive in a fine very lightly mounted mint horizontal pair with one stamp showing the 'MISSING SERIF TO 1 in 1 1/2d' variety. Row 3/2. SG 58. CAYMAN ISLANDS - 1920 1 1/2d on 2d grey PLATE 5 U/M blkx6 with BROKEN FRACTION. SG 58. 1920 1 1/2d on 2d grey 'War Stamp' adhesive in a superb unmounted mint PLATE 5 corner marginal block of six with row 1/2 showing the BROKEN 1 IN FRACTION variety. (BK G26a). A scarce positional piece. SG 58. 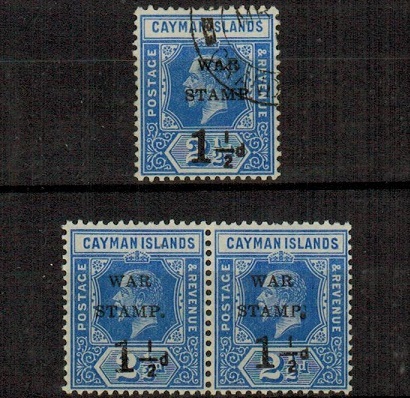 CAYMAN ISLANDS - 1919 1/2d 'War Stamp' mint block of 36. SG 57. 1919 1/2d green 'War Stamp' adhesive in a very fine mint marginal block of 36 (6x6). SG 57. The block illustrated is folded in half. 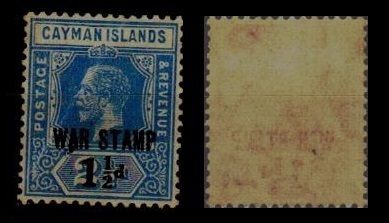 CAYMAN ISLANDS - 1922 2 1/2d bright blue. Fine mint with REVERSED WATERMARK. SG 74x. 1922 2 1/2d Bright blue in fine mint condition showing the variety WATERMARK REVERSED. SG74x. 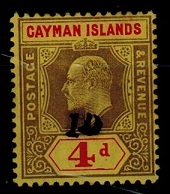 CAYMAN ISLANDS - 1935 'Pictorial' series of 12. Fine mint. SG 96-107. 1935-36 Pictorial series of 12 values in very fine mint condition. SG 96-107. CAYMAN ISLANDS - 1935 1/2d 'Silver Jubilee' blkx4 with VIGNETTE PLATE 2. SG 108. 1935 1/2d black and green 'Silver Jubilee' adhesive in a fine mint corner block of four showing the Vignette PLATE 2 in bottom margin. SG 108.